The time is now, the chance is brief! Stand up and save the coral reef! Amazing pictures lie deep within this great Australian Geographic picture book, alongside a rhyming story that will teach young readers all about the coral reef and the creatures that live there. As you journey below the water line you will see how the coral reef is created, how animals interact with it and how human behaviour is causing damage. The bleaching of the coral reef is touched upon – not dwelled upon – which is important for young readers. Instead, easy tips and suggestions are offered within the story and at the end with a page full of suggestions. The illustrations are spellbinding and add so much to the short story – giving you the parent or teacher to talk about that creature and how they live in the water with the reef. The coral Kingdom by Laura Knowles and Jennie Webber is an excellent book for children of all ages, and one which links in nicely with science, geography and sustainability. Visit the end pages of this and choose an animal you would like to research further. Seek out the suggestions at the end of the story as to how you can save the GBR. Find newspaper articles about the GBR and what is happening to it. Seek out both positive and negative stories. Sign or create a petition about the GBR urging the government to stop coal mining and dredging of the land and sea near the reef. Link up all the rhyming words used. Find more words that rhyme with these words and try to create a few lines that you could add to this story about the coral reef. How much of the GBR has been bleached? How many different types of animals live in the GBR? If the GBR was destroyed how many less tourists might come to Australia? A baby polar bear is looking for his mother in the icy lands of the north pole. As he searches for her he not only comes across some seals, orcas and sea birds, he also discovers how big the ocean is and how important sea ice is to his survival! 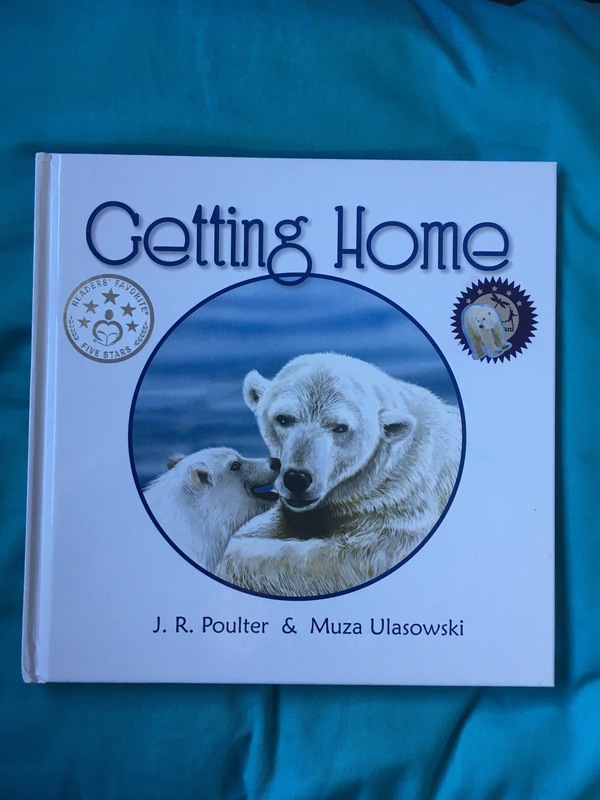 Getting Home by JR Poulter and Muza Ulasowski is a worrying yet heartwarming story of this young polar bear and the real struggles these animals are facing every day. Through stunning illustrations and simple language young children will adore pouring over each page looking for different animals, watching the water splash over the ice and hoping that baby bear will make it back to his mum on the icy land safely. Not only does this book provide a lovely story, it also gives the reader some great facts about polar bears and points out that they do only live in the north – must be a fact that many people get wrong! Getting home also subtly teaches the readers about the importance of sea ice and how without it, Polar bears are going to really struggle to survive. My little bit of ice is getting smaller and smaller…..I can just fit…..Just! Muza Ulassowski’s illustrations are intricately detailed and give the reader a great insight into how polar bears move, how they might feel and how they would be if their home was to melt away. Explore the power of pictures in picture books. Why don’t we need a lot of writing when the pictures can tell us so much more? Explore what the pictures are telling us in this story. Why is this story called “Getting home”. If the title was changed how would it change the feel of this book? Where is the world’s sea ice? Why is the sea ice melting? How is this melting causing problems for Polar Bears? Are there other issues with sea ice melting? What are the causes of melting sea ice? How can you minimise your indirect actions that cause sea ice melting? What might the world look like if the sea ice continues to melt? Books make links to issues that are larger to understand for small people.